By using the Premium Growing System to balance the minerals, with some added sulfur for this heavy ground Pedogenesis customer Kenny Tritz of Graceville, MN grew these impressive soybean roots in 2016. Sulfur builds roots and this is proof that proper amounts of sulfur applied to an already mineral-balanced soil can really mellow and open the soil up to vigorous root growth, which translates into higher yield. If you look at the soil as the stomach or food source for anything that grows in it, the larger the root system on a plant the better. The root system supports and is the lifeline of a growing plant. It’s four major functions are 1) absorption of water and inorganic nutrients, 2) anchoring of the plant body to the ground, and supporting it, 3) storage of food and nutrients, 4) vegetative reproduction and competition with other plants. In general, the plant root system either consists of a taproot system (with primary root) or fibrous roots (adventitious roots) with attached roots and finer rootlets having root hairs close to the tip. The process for photosynthesis occurring in the leaves supports the growth and metabolism of the plant root system. Therefore, plants need to get fluids and nutrients from the ground up through their stems to their parts above the ground. There are immobile minerals in the soil such as phosphate that are picked up and used by the plant when it comes in contact with root hairs. Inside the cells of the root, there is a higher concentration of minerals than there is in the soil surrounding the plant. This creates root pressure, which forces water up out of the root through the xylem as more water and minerals are pulled into the root from the soil. Thus, a proliferation of vital nutrients in the soil is critical, and is achieved with more than the application of potassium sulfate. So the larger the plant roots are, the better or more likely the odds of it coming in contact with vital minerals needed for growth. 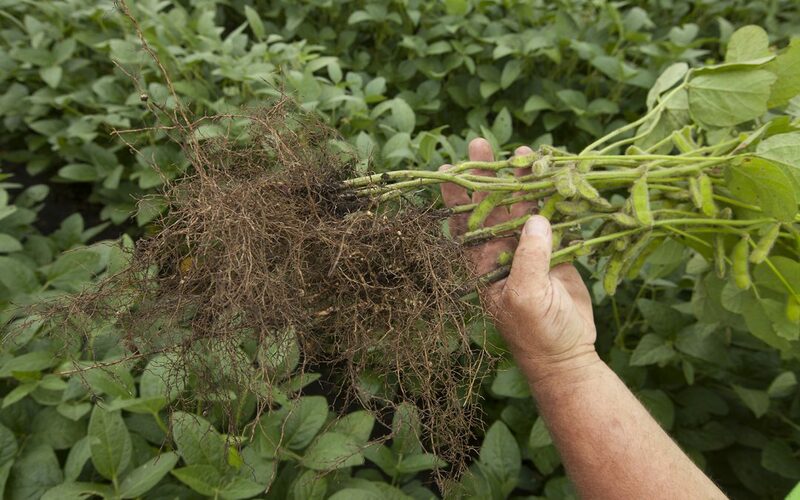 Learn how you can create healthier soil with large roots here. What are your frustration in creating large root systems? Comment below.